Could Isometrics be the Key to Remaining Undefeated in Over 5,000 Bouts? The Great Gama and Isometrics is one of the classic stories told in physical culture circles. With that said many people outside of that small group of enthusiasts haven’t heard of the Great Gama, so here’s an opportunity to get acquainted with the Lion of the Punjab. Gama, who I discuss in detail in my 250 Page course 7 Seconds to Build A Perfect Body!, was a wrestler from India (later Pakistan), and won over 5,000 fights. In fact, to this day Gama is the only wrestler in history who remained undefeated his whole life, in a career that spanned more than 50 years, and the secret to this incredible achievement? Isometrics. The Great Gama and Isometrics have a strong connection. In fact Gama credited Isometrics with developing his near phenomenal strength. 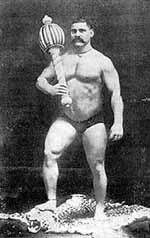 Something brought to light in a conversation with another spectacular strongman – the Mighty Atom. In the fantastic book The Mighty Atom, The Spiritual Journey of Joseph L. Greenstein, by Ed Spielman a conversation between Gama and the Atom takes place. I recount the story in my e-book, but the jist of it is this – though the daily application of Isometric Training against an immovable object, he built a 270lb physique of pure muscle that could fling grown men with ease. Not bad huh? So how did this work exactly? Well the Great Gama understood the fundamental principles of strength development. No matter what form of training you are doing, be it traditional weight lifting, stability ball work, Pilates, kettle bells or isometrics progress ultimately boils down to 2 factors. Intensity and progressive resistance. It’s a proven documented scientific fact that the more intense an exercise is the more stimulation and thus strength increase and growth is produced. Duration on the other hand (I.e. continuous low weight repetitions) produces little improvement. The second aspect is progressive resistance. In order to make continual improvements one must challenge the body as it adapts to the stress placed upon it and becomes stronger. Essentially if you are training with enough intensity to produce muscular growth, then you will get stronger. To develop on this you must then push yourself harder still. Of course, there are many ways to do this as I have mentioned but the most efficient stimulation, the most intense and thus the most effective is that performed by the Great Gama and Isometrics is the basis of that system. There is no greater stimulation that that which is just beyond the current capabilities of your musculature. Check out this article on Isometrics and Weight Lifting to learn more. You may also want to check out this article on Isometrics Versus Traditional Lifting for another overview of why Gama choose to perform isometric exercises. If it was good enough for the Lion of the Punjab to use, perhaps Isometrics should be part of your training routine too? Find out more and check out the incredible results you can achieve using isometrics here – 7 Seconds to Build A Perfect Body!. You’ve been reading about The Great Gama and Isometrics, check out the next isometric article, - here.